The Deal: bikes are available Now at a special price for limited time. See Pull down menus below. Warning: bikes always sell out fast so order now *Order now to lock in your sale price and selection. The Process: When you order, your card will be billed for the full amount. You'll get an auto-email the next business day. Fri. Sat. Sunday orders get emails on Monday. Weekends/Holidays are not counted as "days". Your Shipping Address: Please ensure your address is correct when you order. Last minute changes will incur delays and/or extra costs. Your shipping address can be changed on the 3rd page of checkout. Click on "change" beside the address. You can do whatever you want with a Motobecane Gran Premio PRO Reynolds 853 Road Bikes, but if you're anything like the guys at Motobecane, you're gonna want to cruise a century ride in style and comfort or travel unfamiliar blue-line highways on this bicycle. Maybe ride it to your reunion. Maybe all on the same day? The Gran Premio PRO Reynolds 853 frame is supremely comfortable and offers incredible performance and strength. Motobecane's product engineers designed this bike for comfortable performance. The angles of the butted, Reynolds 853 Chromoly frame are relaxed for stability, the wheelbase is just right, the clearances around the wheels sufficient for most tires up to 700x25c. The Reynolds 853 Butted frame is handcrafted and has a precision machined bottom bracket shell. Top Tier High Grade Steel, Reynolds 853. One of the best high grade steel alloys available. Precision butted on mandrels, 853 is offered in a wide range of tube sizes. Reynolds 853 is a super high strength steel that allows a thin gauge tight tolerance tube providing healthy weight savings and incredible ride quality. The wheels have PRO level Ritchey WCS Vantage wheels. The MSRP of the wheels alone are about $800. The drivetrain, is FULL 2019, 22 Speed Shimano 8000 Ultegra derailleurs + Shifters with a Pro Level Upgrade to FSA SLK Carbon Cranks. The NEW 22 Speed Shimano 8000 Ultegra drivetrain has the same smooth shifting Shimano Drivetrain technology that has been ridden to numerous podiums finishes in many top level races and many more. Some say it's virtually the same pro level performance as Top of the Line Shimano Dura Ace 9000 series which costs hundreds more. What bike should you buy? All Gran Premios are great for road riding and for light touring as it has rear mounts for your racks/panniers. The carbon forks and sweet geometry with the plush ride and durability of Reynolds High Grade steel is hard to beat. When you consider this Gran Premio PRO is made of one of the Best materials available, Reynolds 853; the choice is obvious. Get the Gran Premio PRO Reynolds 853 Road Bikes. Lots of customers love this bike and we always sell out before we can get more. With 22 Speed drivetrain/compact cranks, the PRO has about the same gear range as a triple 3x10 but with much lower maintenance, easier shifting and lighter weight. Tight budget? Get the Gran Premio Elite if you want a similar sweet Reynolds high grade steel riding bike that's fun and responsive for nearly any road riding you might want to do. A bit heavier than the PRO and with a 2x11 Shimano 5800 drivetrain. Tighter budget or want to go on longer trips? Get the Tourist For serious loaded touring/ long trips but it won't be as light or responsive as the Gran Premio PRO/Comp/Elites. The Tourist has a more slack geometry for stabillity handling heavy loads and a heavier duty frame+ Steel forks with front rack mounts. Whichever you decide on these bikes will sell out soon - Get one before they are gone. 46cm - 5'0" to 5'4"
Sizing is a personal preference, the final choice is up to you. Between sizes? Size up for higher bars, more casual riding / longer arms/torso. To pick a size, find your favorite size road bike and measure the top tube horizontally from center to center and pick the size that has the top tube closest to that length. We sell lots of bikes but it is generally hard to get any NEW 22 Speed Shimano 8000 Ultegra equipped Steel specific designs at less than $3,500. 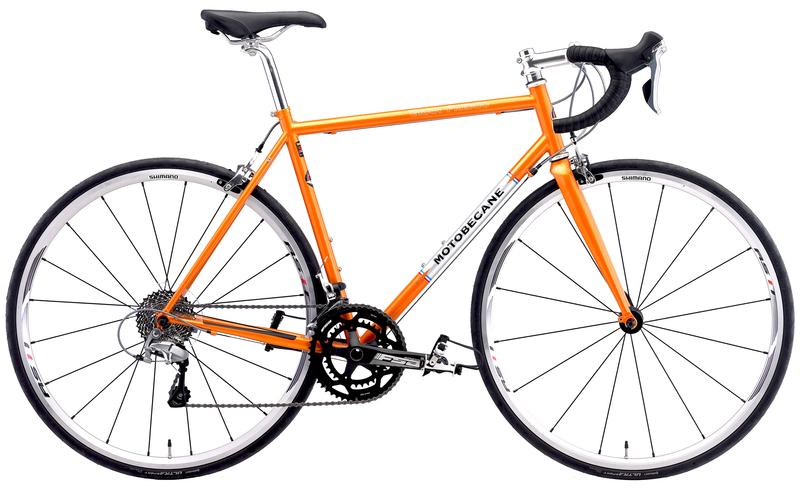 The Motobecane Gran Premio PRO Reynolds 853 Road Bikes is perfect for the Century, Commuter or Trekking Rider who wants a top quality steel road bike - but does not want to spend their kids college tuition to do it. The Gran Premio PRO Reynolds 853 Road Bikes' ride, quality and looks are fantastic! FACTORY DIRECT PRICES SAVE YOU Over $2,000 Off! This bike comes up to 90 percent assembled.